The Ladybug was my first Spyderco pocket knife years ago. It started an obsession over what gear to carry in my every day life, which still is with me today. My sister fell in love with the Ladybug at a family gathering and I had reluctantly given it to her. I always meant to replace it, but when I saw the Spyderco Manbug on sale from an Amazon seller for $24, I couldn't pass it up. I was going to resell it, but yeah, you know how that goes. The Manbug and Ladybug are two of the smallest locking knives in Spyderco's lineup. They make the smallish Dragonfly look big by comparison. Unlike the Ladybug I had, with its hollow ground blade, this Manbug has the flat ground blade characteristic of most Spyderco knives. With a full flat ground blade, a fiberglass reinforced nylon handle and a back lock. Made in Japan with VG10 steel, this is a serious knife, even for its diminutive size and weight. I have never unboxed a Spydero I didn't like, and my streak is unbroken. Opening it one-handed, it reminds me of a tiny Delica without a clip. The blade didn't come as sharp as I'm used to for their lineup of VG-10 knives. Overall, superb. If you're paying 40 dollars for a tiny pocket knife that could fit on your key chain, then you're not doing it for the looks. This whole line of FRN handle back locks with the VG-10 steel is well built. And as I've collected them over the last few years, I've noticed that the quality hasn't decreased over time like some popular products do. Getting into specifics, the FRN handle is perfect as far as I can tell. Some people ding the build quality of this line of knives in their reviews because they have no liner. But this is by design. The blade is well done, and so is the lock. All the machining for the stainless steel used on the blade and lock looks perfect. The pinned construction is nice, though the screws look a little cheap, which is not usually characteristic of Spyderco. But they don't look "cheap Chinese" cheap, so it's a small gripe. Overall, very good. As always, even with high quality products like this, there's always at least one thing that holds me back from giving it a perfect score, and for this one, it's the edge on the blade. I wouldn't say that it came dull, but it came with a poor edge which went completely dull after a couple weeks of use. Looking at the edge, it looks like they got the angle slightly wrong on one side. I don't sharpen a knife until I'm done reviewing it, so it's a little disappointing. But other than the edge, my review sample is basically flawless. The bi-directional texturing on the handle is perfect; even better than most of my other Spyderco FRN knives. The jimping is cut perfectly, blade centering is perfect, and where the blade meets the lock, it looks like it was cut from a single piece of steel-impressive. The heart of a knife, the Manbug has a full flat grind, VG-10 Japanese steel blade. This is my favorite blade geometry for every day carry (EDC) because it's a jack-of-all-trades shape. The "spydie hole" looks a little funny on a blade this small, but it's just as functional as its bigger cousins. The jimping cut into the blade flows into the jimping on the spine of the handle.The laser etched spider logo is perfect, and so are the maker stamps. In fact, the stamps look a little better than my other Spyderco. I wonder if they re-tooled the production line because of how clean the stamping and handle texturing are. The fiberglass reinforced nylon (FRN) handle is my favorite thing about this line of knives. It's strong and super light. Most people either "get it" or they think it looks cheap. 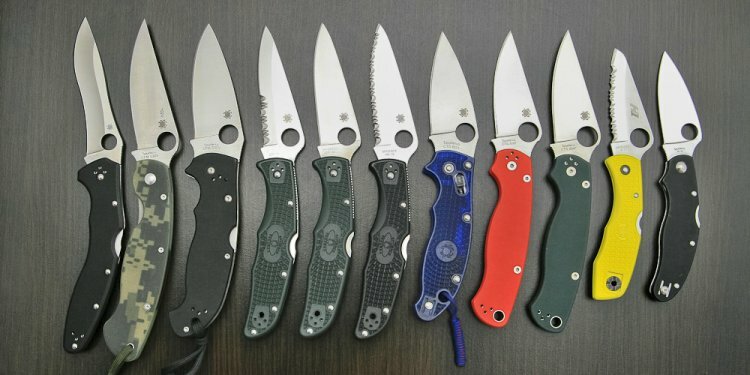 For those people, Spyderco has lots of G10 and other styles. This style of knife has no steel liners, and in my opinion doesn't need them. This makes the knife a little less rigid than other designs, but the payoff is in the weight. I also prefer the texturing of these FRN models over G10. Don't get me wrong, I love G10, but the way they do the bi-directional on this line gives it a much better grip. The Manbug uses a back lock, which is typical for this whole line of knives. It's the second main reason why I like this line, and this one is no different. The lockup on my review is smooth and solid. There's no play or hint that there would ever be play. This model has no clip. Pity, but it does have a lanyard hole. Honestly, I think if was going to carry a knife on my keychain, it would probably be some flavor of a Victorinox Swiss Army Knife, which have a much more keychain-friendly shape and reputation. But if you make awesome paracord lanyards, then you can go to town, as they made the hole plenty big enough. This model has two torx screws for the pivot and lock retention screw. Some of their more complicated models use "pinned construction" which is basically just rivets. It's no picnic (for me at least) to take apart these FRN lock backs, but you have that option if you want it for this model. I wish they would have screws on all their models, but I guess if I got my knives so dirty or muddy that I had to disassemble them, then I'd probably just carry a fixed blade. There's not many companies that I trust enough for them to say "this knife is so good, you'll never need to take it apart." My Manbug lives in a small EDC tool pouch that I carry with me anywhere I go in the truck. The pouch has basic stuff like a Victorinox Executive, tactical pen, small scissors, Leatherman Squirt PS4, and a couple other goodies. Most of the time I still EDC the Native or Delica, and some of the tools in my pouch like the Manbug serve as backups. But even as a backup, this knife has seen heavy use. Certain times I don't have my primary EDC, like a doctor's appointment or job interview. So there are numerous times when I feel for the knife that isn't in my pocket, and then go grab this one.